App review times for both new and updated apps have been a major pain point for developers targeting the iOS/OSX platforms. 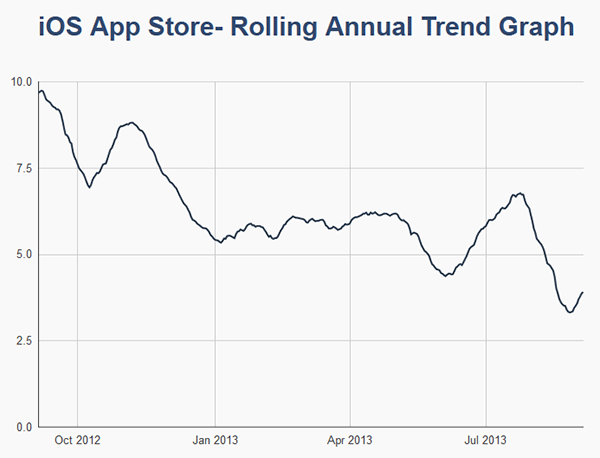 With review times reaching upwards of 20 days, the consequences of submitting an app with a major flaw are serious. Lately however, review times have been down right speedy. The frustrations of the app store review process are well documented. When you add in super long wait times you end up with a lot of angry developers and businesses. I’ve talked to many companies who have chosen the Android platform over the IOS platform for a product specifically to avoid the issues with Apple’s review process. In comparison to the historical 10 day review average for new apps in the app store, the zero wait time of the Google Play store can be very attractive. You can get your product out immediately, avoid red tape, and iterate more quickly. There is more to the story than wait times of course. The review process Apple has imposed is largely a quality control measure. Thanks to this measure, the app store is filled with apps of the highest quality while the Google Play store is rife with unusable garbage. When you’re building an ecosystem from the ground up, these reviews can vastly improve your product, and it has clearly worked. Even so, the wait times have been excessive. Having to wait 10 days to correct a bug in your code or adapt to an API change which brings down your app will essentially ruin you. Apple appears to have finally come to see reason where the last point is concerned. Ignoring the massive developer portal outage which rendered the review process moot for over a week, the latest trend in review times shows that the waiting period has been significantly reduced. In our latest iOS submissions, we’re seeing new app reviews happen in around 4 - 5 business days and app updates go into review in just 2 - 3 business days. That is a 50% reduction in wait time over the historical averages. Shiny Development maintains a micro-site to track average app store review times and they are validating what we’re seeing in actual practice. Their data collection is crowd sourced so it’s not an official representation of Apple’s review times, but seeing as Apple never updates their own review estimates, this is about as official as it gets. This is good news for every app developer. When Apple releases the much anticipated in-app updating feature, developers will finally be able to count on their feature deployments and bug fixes reaching the end user in as little time as possible. This should result in an increase in speed of application improvement and developer creativity. Read more of Matthew Mombrea's ByteStream blog and follow Matt on Twitter (@mombrea) and Google+. For the latest IT news, analysis and how-tos, follow ITworld on Twitter and Facebook. Matthew Mombrea is a software engineer, founder of Cypress North, and a technology enthusiast. The opinions expressed in this blog are those of the author and do not necessarily represent those of ITworld, its parent, subsidiary or affiliated companies.